Phanor Montoya Maya, the Director of Corales de Paz in Colombia, is passionate about protecting coral reefs, and the fishing, tourism and coastal protection services they provide. Phanor attended CSF’s 20th annual international Economic Tools for Conservation course in Berkeley, California this summer to support Corales de Paz’s ongoing work in coral reef conservation. The organization is currently implementing a large scale coral reef restoration project near San Andrés and Providencia islands in the Caribbean Sea. “Coral reef conservation has been happening in this area for a long time through both passive and active actions by the government, NGOs and dive operators. But there was no collaboration between parties and that put the success of those projects at risk. We identified the need to join our efforts,” Phanor told CSF during the course. This project is the first large scale coral reef restoration project in Colombia that will involve coordination among all local stakeholders. 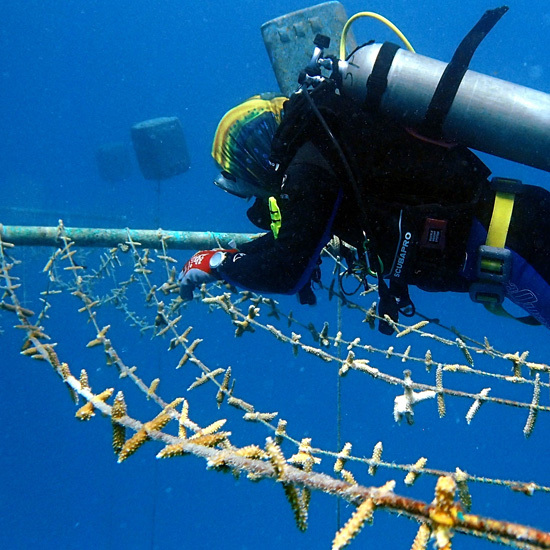 Corales de Paz specializes in reef rehabilitation via “coral gardening,” the cultivation of coral fragments in underwater nurseries and transplanting the nursery-grown colonies onto deteriorated reefs. In the San Andrés/Providencia project, nursery sites were selected from discussions with all stakeholders, which include the provincial government, the local environmental authority, and local dive centers and fishing communities. The decision of where to transplant will also be made in a participatory way and should lead towards signing voluntary conservation agreements for the rehabilitation sites. This ensures that all parties feel decisions have been made fairly, and no one group loses more income during rehabilitation, or gains more in potential future benefits. As a result, local capacity in coral gardening has grown and the project is providing an alternative source of income for some members of the community. “The project aims to increase the value of the ecosystem services provided by coral reefs to fishermen and tourist operators in San Andrés and Providencia islands. We will achieve this by increasing live coral cover by at least 10% through the addition of thousands of nursery-grown corals. We expect that this exercise will translate into an increase in fishing stocks, and divers and tourists that are willing to pay more to visit the archipielago,” Phanor explained. So far, nine nurseries have been built and a stock of over 5,000 fragments has been moved to the nursery sites. This includes staghorn (Acropora cervicornis) and elkhorn (A. palmata) corals that are in critical danger of extinction. After two months, over 90% of corals in the nursery survived and have grown 30% larger than their original size, putting them on track for successful transplantation. Up to this point, reef sites for rehabilitation have been selected for biological and social reasons, but economic analysis could also aid in reef selection by providing information to compare cost efficiency. Phanor plans to use the skills he gained at the CSF course to “assess the financial and economic feasibility of our projects, and choose the best-case scenarios for implementation, protection and restoration actions.” Thanks to our course, Phanor has more tools to support his work and sustainable reef restoration projects in Colombia. Phanor’s participation in the course was made possible by the WWF Russell E. Train Education for Nature Professional Development Grants program.